In today’s fast-paced business environment, speed equals competitive advantage. But for sales teams that still rely on paper marketing materials, quotes, and contracts, it can take weeks or even months to get from quote to close. This white paper reveals the way to close deals five times faster and track documents in real time. 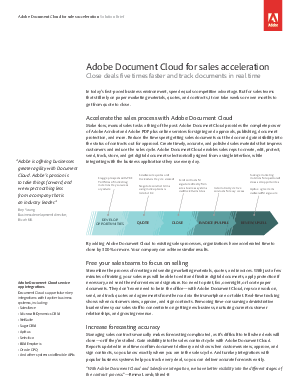 Download this paper now and find out how Adobe Document Cloud can help sales teams close deals faster.